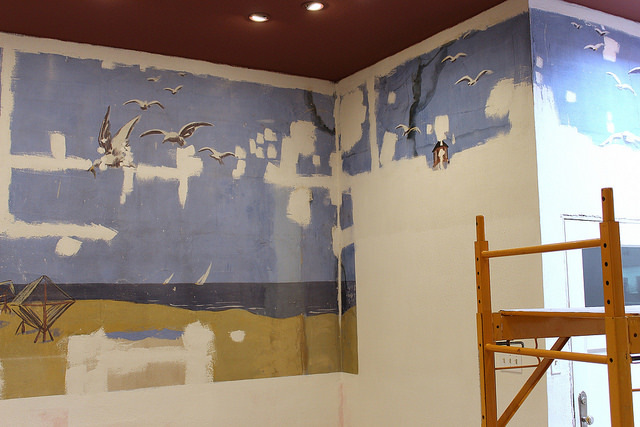 Here at the Center, the conservation of murals is something in which we take great pride. 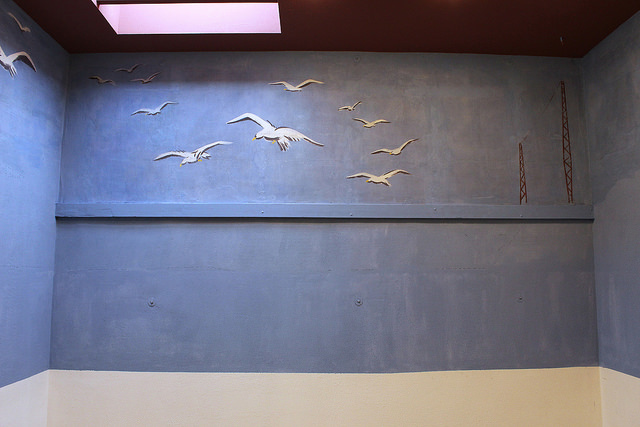 In the early 1990s, our CEO Heather Becker co-founded a large-scale mural preservation project which restored a selection of Progressive and WPA-Era Murals in Chicago Public Schools. Since the completion of the project, The Center has continued to treat murals of various materials, time periods, subjects, and sizes. For this reason, we were especially excited when the Ruth St. John and John Dunham West Foundation contacted us about restoring a mural painted by Lester W. Bentley located on the West Foundation’s property. Although Bentley is best known for his portraiture, he also painted several murals, including a series for De Pere's former post office, and the Sacred Heart Church in Two Rivers, Wisconsin. Bentley was born in Two Rivers, and although he moved to Greenwich, Connecticut after he was married, he often came back to Wisconsin in the summers and maintained a studio in Two Rivers. What makes this mural’s story even more interesting is that, had it not been for a leaking skylight, it might never have been discovered! Forgotten and almost entirely covered by plaster, paneling, and cabinets, the mural was found during construction efforts to fix a leaking skylight in the West Foundation’s garage. The plaster onto which the mural had been painted was so badly damaged that our conservators determined this project would need not only the work of our team, but also a plaster expert to fill in the walls, as well as an outside artist to recreate the missing parts of the mural. Depicting a journey from Two Rivers to an exotic beach town, the mural is characteristic of fresco secco with moderately applied tempera. Translated from Italian, "secco," meaning "dry" fresco, is a method of applying paint onto dried plaster. Unlike the similar method of buon fresco, in which paint is applied to wet plaster and fused together in the drying process, fresco secco is much more prone to flaking and other damage. 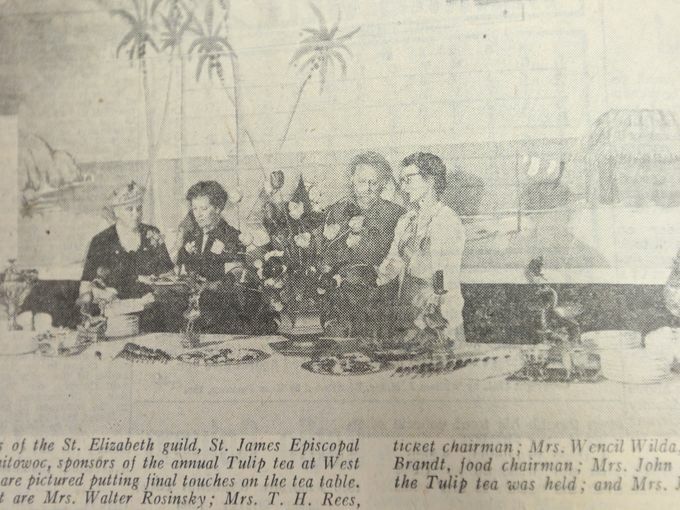 After the mural’s discovery, the West Foundation began to research the origin of the mural and stumbled upon an article from 1939 describing Ruth West’s Annual Tulip Tea, which mentioned a mural painted by Bentley on the walls of the recreation room. Bentley’s authorship was confirmed when the removal of a cabinet uncovered his signature at the bottom right corner of the west wall. According to Gail Fox, a board member on the West Foundation, Bentley studied mural painting at the School of the Art Institute of Chicago. He worked on several murals in Chicago, including at the 1933 Century of Progress Exposition. In 1935, he traveled to Mexico for a period to immerse himself in the work of Mexican Muralists and to absorb the rich Mexican culture. In Taxco he studied with Valentin Vidaurreta, met Roberto Montenegro, and learned egg tempera techniques from Tamiji Kitagawa. He also spent time in Acapulco. After his return to Two Rivers, he opened a studio. "It seems likely that this important journey to Mexico was the impetus for the mural that he executed for John and Ruth West," Gail explained to us. The tempera paint had been directly applied to roughly-textured plaster walls, as well as wooden structural supports and a wooden panel built to house and cover electrical panels. Although some walls were in better condition than others, all had holes with some areas of missing paint, and extensive staining and tidelines throughout. There was also evidence of mold, and the flaking paint was determined to potentially have lead content. The south wall had only the top third of the mural remaining, while some smaller sections on the east wall had only a quarter still intact. In addition to the completely covered sections, large areas of the mural were extensively damaged by a deeply inscribed grid pattern, which was then covered with a thin layer of plaster; however, a thin ghost layer of the mural remained visible. Although this area was not salvageable by our conservators, they recommended that an outside artist be hired to recreate the mural by referencing the tracings of the ghost image along with old black and white photographs. The artist could then also extrapolate the image over the sections that had been completely plastered over. Due to the possibility of lead content, a lead paint specialist was consulted. Next, to begin treatment, a tracing of the ghost image on the badly damaged plaster was made to aid the artist’s later recreation of the mural. An outside plaster specialist then filled the damaged sections using a similar plaster as the original, with fills adjusted mechanically by our conservators using scalpels and commercial filler as needed. After extensively testing the solubility of the paint with various solvents and application methods, our conservators determined that the paint was extremely soluble with everything except aromatic solvents. Unfortunately, any sort of aqueous cleaning resulted in additional tidelines, regardless of the application method. Our conservators decided that dry cleaning was the safest option. Due to the friable nature of the paint, this was done extremely carefully with a combination of brushes, textile sponges, and a conservation-grade vacuum, depending on the fragility of the area. Two coats of matte resin, close in sheen to the original paint, were then brushed onto the mural to consolidate the friable paint, and the ghost images were transferred onto the newly plastered surface using graphite paper in preparation for painting. Our conservators then carefully inpainted any fills, tidelines, and mold stains. The wooden panel containing the electrical boxes was treated separately at The Center's lab. The piece was consolidated and cleaned, and shallow irregularities and holes were filled using conservation-grade filler tinted with dry pigments to match the base wood color as closely as possible. The panel was then reattached to the wall using drywall anchors and screws. The contracted visual artist, Janel Maples, designed any missing sections and repainted the traced ghost image. With visual references provided by the West Foundation, she executed the painting to mimic Bentley’s original style using Golden matte fluid acrylics, and seamlessly joined her work with that of the original design. Next, the floor, ceiling, and below the chair rail were then painted back to the original red color by a contracted painter. The effect of being submerged into the mural was now complete! Thanks to the joint efforts of a team of our conservators, historians, craftsmen, and a local artist, this mural can now be celebrated as a significant part of both the West Foundation and Lester W. Bentley's heritage, and of Manitowoc’s Two Rivers history. The West Foundation plans to open the Mural Room to the public for limited hours during next year's garden season. At present, the gardens must be closed soon after Labor Day for a construction project (which will provide more parking). The Foundation, located at 915 Memorial Drive, Manitowoc, WI, operates year-round to carry out its philanthropic mission. The Lester W. Bentley Art Collection: Two Rivers Historical Society. Two Rivers: Lester Public Library.